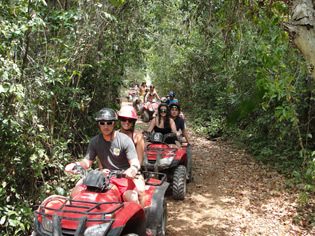 Ride ATVs through the jungle trails, just south of Cancun in the Riviera Maya. Your tour is headed up by our experienced guide. We ride ATVs to two different cenotes where you can explore, swim or zip line into the fresh water. Next we go through our challenge course with fun zip line over the jungle canopy and balance obstacles.